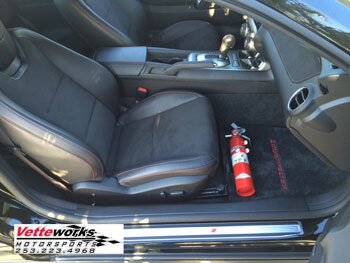 Vetteworks offers brackets to mount Amerex fire extinguishers to the front of the passenger seat for '94 thru '04 Mustangs. All brackets fasten to the front two bolts of the seat mount. They must be installed with the seat adjusted fully back and there will be very little seat adjustment once the bracket are installed. There is still room to get passengers in the back seat. The Stanguisher extinguisher brackets are constructed of cold rolled steel, precision abrasive water jet machined parts, MIG welded and are powder coated gloss black. Stanguisher Mustang extinguisher brackets will only work with 1.0 to 2.5 LBS Amerex fire extinguishers. Vetteworks Chevelle fire extinguisher bracket will fit from 1964 through 1972 model years with bucket seats. Brackets are bolt in with no modification to your car. Bracket is designed to fit with all Amerex extinguishers from 1.4 oz to 2.5 LBS units. We have Halon, Halotron 1 and dry chemical available. Vetteworks Pontiac GTO/Lemans fire extinguisher bracket will fit from 1964 through 1974 model years with bucket seats (passenger side). Brackets are bolt in with no modification to your car. Bracket is designed to fit with all Amerex extinguishers from 1.4 oz to 2.5 LBS units. We have Halon, Halotron 1 and dry chemical available. See the fire extinguisher category. Vetteworks offers fire extinguishers and mounting brackets for installation on the left side of the driver seat for '76 thru '04 Jeeps. The bracket does not effect the seat adjustment once the bracket is in place. The Jeep brackets can come with your choice of a 1.0 or 2.5 lbs red or chrome dry chemical, Halotron or Halon fire extinguishers. 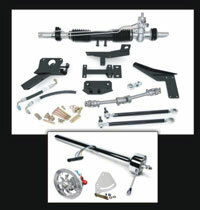 To view pictures of Jeeps with the Vetteworks Brackets see the customer page below. The Vetteworks Jeep Fire Extinguisher brackets are constructed of hot rolled steel, precision abrasive water jet machined parts, MIG welded and are powder coated gloss black. All Vetteworks Jeep brackets come with detailed instructions. Note: Vetteworks brackets only work with Amerex extinguishers. 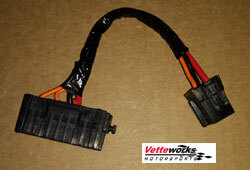 Vetteworks 1998-2002 Camaro/Firebird , 1997-2004 Corvette radiator fan Harness. 92-97 LT1 Throttle Body Plate Fill Engraved "LT1"
Dress Up Your Engine Compartment with one of Vetteworks LT1 billet aluminum throttle body plates. Plates are designed to fit 1992 - 1997 LT1 Motors, and come complete with a raised bowtie. Throttle body plates are CNC machined. 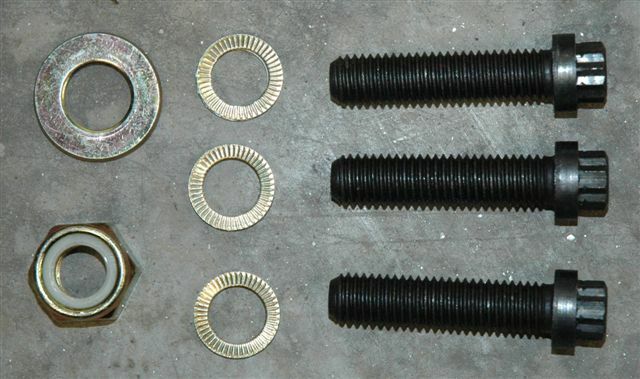 Replacement fastener kit for the front and rear C5/C6 wheel bearings. This kit uses 12 point reduced head grade 12.9 (175, 000 PSI) M12 cap screws, Nordlocs, and a M14 Nyloc nut with hardened washer for the lower ball joint. Can be used with the OE or our new HD bearings. The OE Torx head bolts loosen, and the head strips out. With these you use a standard 12mm 12 point socket and they allow proper torque for greater reliability and ease of assembly and removal. Can be used many times. 4 kits are needed per Car. Available in April 2016, Bracket will fits manual and power seats. Installs in seconds and does not modify the seat. Fits 2010 Camaro to current. For more information call 253-223-4968. 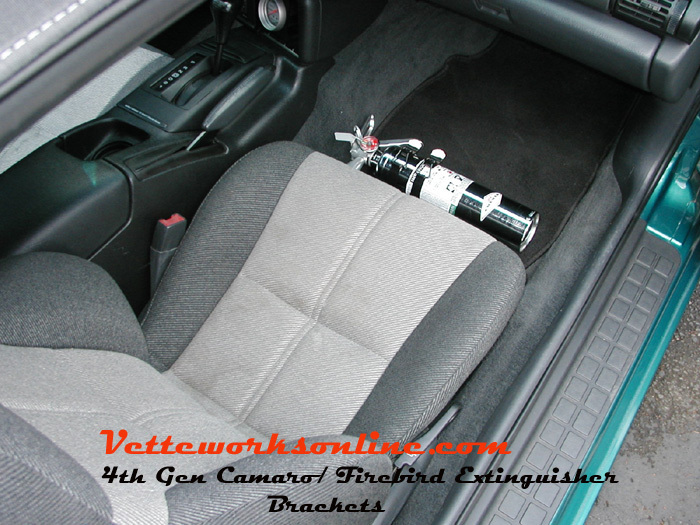 Vetteworks offers brackets to mount Amerex fire extinguishers to the front of the passenger seat for '93 thru '02 F-Bodies. All brackets fasten to the front two bolts of the seat mount. They must be installed with the seat adjusted fully back and there will be very little seat adjustment once the bracket are installed. There is still room to get passengers in the back seat. The F-Body extinguisher brackets are constructed of cold rolled steel, precision abrasive water jet machined parts, MIG welded and are powder coated gloss black. The brackets can come with your choice of a 2.5 lbs red or chrome dry chemical or Halotron fire extinguishers and all fire extinguishers come double strapped at no extra charge. The extinguisher brackets will only work with Amerex fire extinguishers.